With a medicinal value dating back thousands of years, ginger has been well researched with many of its traditional uses confirmed and still used today.Ginger, also known as Zingiber officinale , is from the Zingiberaceae family, which is closely related to the turmeric and cardamom. Ginger originated in the tropical jungles of Southern Asia, dating back to over 5000 years ago, and is mentioned in ancient Chinese, Indian, and Middle Eastern writings and prized for its culinary and medicinal properties. The commonly known spice ginger is the rhizome (the underground portion of the individual spears) of the ginger plant. 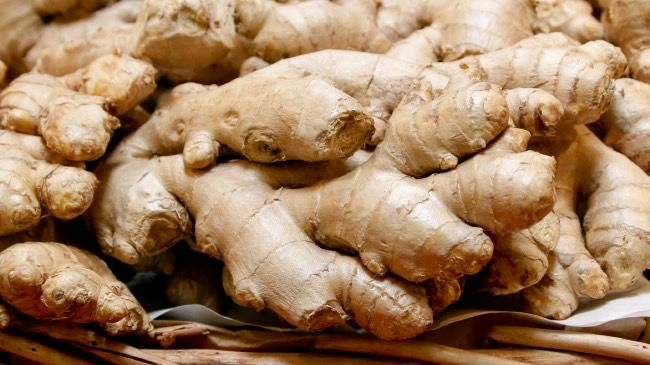 Why is ginger so great for your hair? In Ayurveda, ginger is highly regarded as a hair growth treatment. There are several components in ginger that aid in hair growth like magnesium, phosphorous, and potassium. These minerals help stimulate blood flow to the scalp, which encourages restored hair growth. Ginger has an abundance of fatty acids that help with thinning hair, so while it is encouraging blood flow to the scalp it is also preventing thinning hair from turning into hair loss. Ginger has natural antiseptic properties that provide alleviation for dandruff. Just mix 2 tablespoons of grated ginger with 3 tablespoons of olive or sesame oil and a dash of lemon juice. Massage into your scalp and leave in for 30 minutes or overnight before rinsing. This mix should be used at least three times a week until dandruff has been remedied. Besides helping with hair growth ginger is also known to help with eliminating dandruff and adding sheen. Thinning edges is a common problem and can occur from genetics, hormones, certain medications, or excessive styling. Overuse of ponytails that are pulling too tightly, slicking down edges with gels that contain drying alcohols, wig caps, and glues can also damage your delicate edges. With the blood circulating properties in ginger, you can turn a nightly massage into something more than just a relaxing way of drifting off to sleep. You can simply squeeze the juice from the ginger and massage it into your edges with with jojoba oil avocado oil. This should turn into a nightly routine to encourage the hairs to stop breaking and to regrow those edges. Keep in mind that ginger does two things for thinning edges: stop the hair from falling off by even more and stimulate the hair follicles to grow at its own optimal speed. It does not make it grow faster, but it increases blood flow to the scalp to stimulate the hair follicles and encourage growth. Mix equal parts of ginger root oil with another oil like jojoba, avocado, or olive oil. Massage the oil mixture onto the scalp around the edges gently and in a circular motion. This can be used on your entire scalp as well. Do nightly until you feel they have grown back fully. There is no need for a lot of the mixture to be used during each application or you will end up with an oily mess ,so use enough to gently massage and not leave significant residue. Understand that this will not work if you are still using those techniques that may have caused the thinning edges in the first place so do not cause tension to your edges while you work on growing them back. If the scalp is thinning due to hormonal problems or medicine then seek the advice of a medical professional on what you can do to revive the problem without interfering with your health. If you are more interested in just using ginger as a hair growth remedy, then I have a great and popular mix below! Mix ginger and jojoba oil together before applying directly to your scalp and massage in circular motions gently. Allow to sit for 30 min. (you may notice a warming sensation but nothing to worry about. That just means it’s working!). Proceed to shampoo and condition.